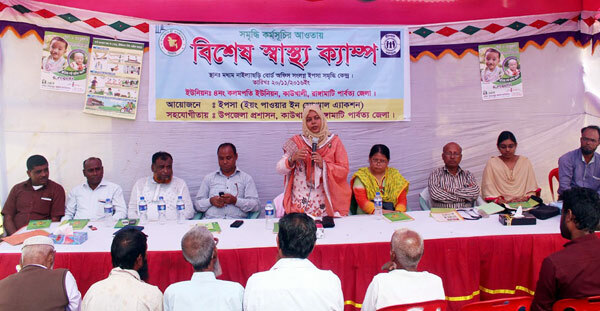 YPSA and Kowkhali Upazila Administration jointly organized a Special Health Camp at the premises of EENRICH Center, Kolompati Union, Kawkhali on 20 November. Objective of this camp is to provide primary healthcare service at no cost and create awareness among the community people who are underprivileged and devoid of healthcare facilities. 263 patients have received treatment on fever, pain, asthma, pneumonia, diabetics and iron and calcium deficiency. Glucose tolerance tests were performed on 73 patients. Kowkhali Upazila Nirbahi Officer Afia Akter; Chairman of 4No. Kolompati Union Parishad Kezai Marma; Rangamati District Family Planning Officer Dr. Bebi Tripura; Medical Officer Dr. Prodip Kumar and Sub-Assistant Community Medical Officer Surovi Das from Kawkhali Upazila Health Complex; President of Kawkhali Press Club Ariful Hoq were present during the inaugural of the health camp. 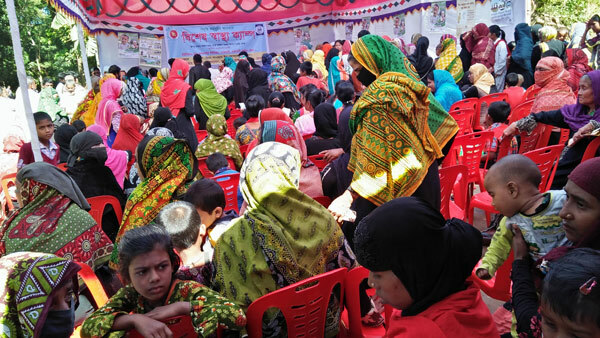 This health camp is arranged under the project “Enhancing Resources and Increasing Capacities of Poor Households Towards Elimination of their Poverty (ENRICH)” implemented by YPSA and supported by Palli Karma-Sahayak Foundation (PKSF).